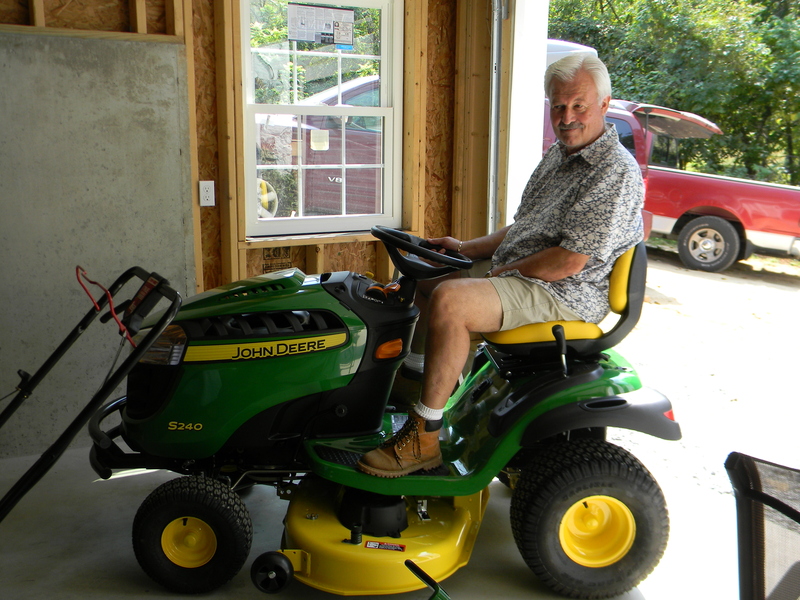 Chris has been (patiently) waiting for the garage to be completed so he can pick up the Deere he ordered. He’s been diligently cutting the lawn with a push mower for the past three months, so it was with a bit of fan fare that he took delivery this weekend. Miguel picked him up at the farm at 9 AM sharp with the pick-up truck and trailer, and off they went. By the time Becky and I got back from heading in a different direction to pick up all the light fixtures for the house, they had the green tractor unloaded, gassed up and ready to go. 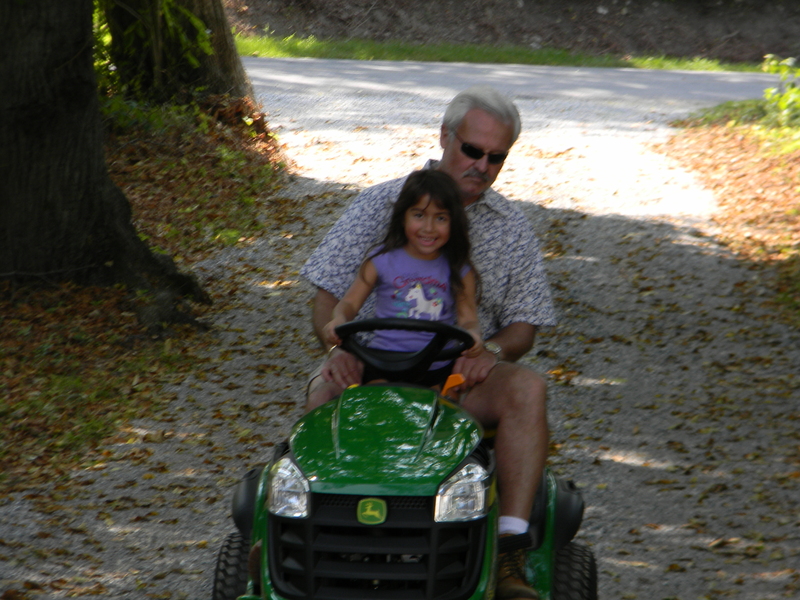 Arianna got to share in the inaugural ride, and Opa even let her steer a little bit. 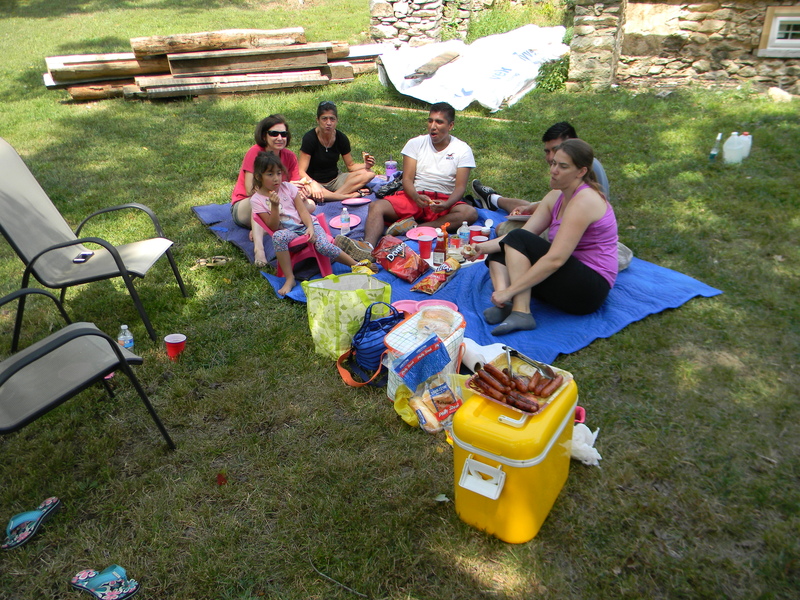 We celebrated with a picnic of hot dogs on the front lawn — because there is really no other place to sit. The backyard, where the patio will be, is full of bricks and a cement mixer since they are in the middle of building the chimney. The garage is full of construction materials — and the house is full of dust. A blanket under a tree in the front yard next to the dumpster full of remodeling debris was about as good as it gets. To quote Arianna “This is gonna be so much fun.” And it was. ← August – Can you see our vision? Wonderful memories!!! I love it! Arianna is right!! It will be so much fun!!! Congratulations to Chris for finally “getting a Deer”!! Can’t wait to see the house again! I’m sure a splendid time was had by all! And it won’t be long before your picnicking on your patio. You’ve been through a lot in the past six months, but look how it’s coming together! It’s going to be worth it. 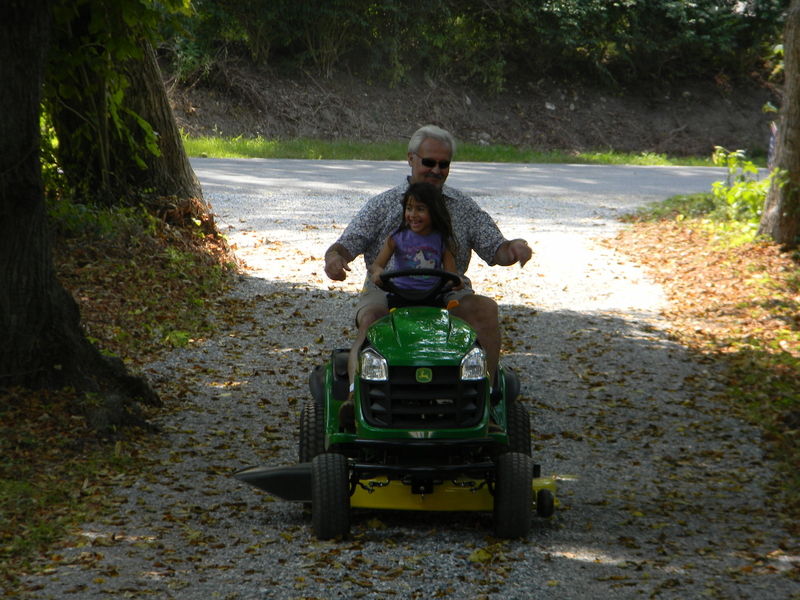 It’s hard to tell who enjoyed the Deere more — Chris or Arianna. Where do I start. You would look great on the cover of Farm and Tractor magazine. Nice boots. Lot more comfortable than low lander boat shoes, huh? With hunting season coming up it would be a cool idea to have a deer strapped over the hood of your deer.